"We have these at most of our neighborhood gatherings. Everyone always asks for them." Hollow out each mushroom cap, reserving scrapings. Heat a skillet over medium-high heat. Cook and stir sausage, onion, and reserved mushroom scrapings in hot skillet until sausage is browned and cooked through, 4 to 6 minutes. Drain and discard grease; return sausage mixture to skillet. Stir 3 ounces Parmesan cheese, bread crumbs, garlic, and parsley into sausage mixture. Cook and stir until heated through, 3 to 5 minutes. Stuff each mushroom cap with sausage mixture and place on a baking sheet. 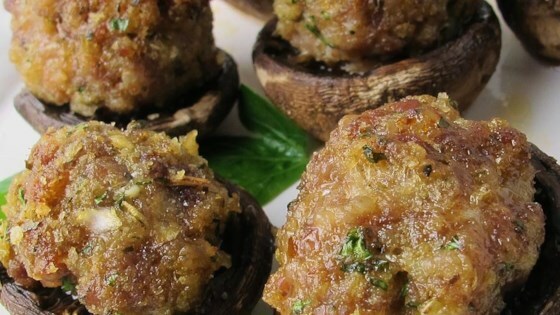 Bake stuffed mushrooms in the preheated oven for 12 minutes. Sprinkle remaining 1 ounce Parmesan cheese over mushrooms and bake until mushrooms are cooked through and cheese is melted and bubbling, about 3 minutes. I make a very similar recipe to this but I add cream cheese to this mixture which gives it a creamy texture. To me, without the cream cheese the stuffing is too dry. My husband asks me to make these apps - they make the night start off deliciously. I do not find these dry at all with the sausage. I substituted the parmesan cheese with mozzarella which made the stuffing really creamy.